There isn’t much opportunity to do a day’s racing for £50, but that’s exactly what Daytona Motorsport are offering. 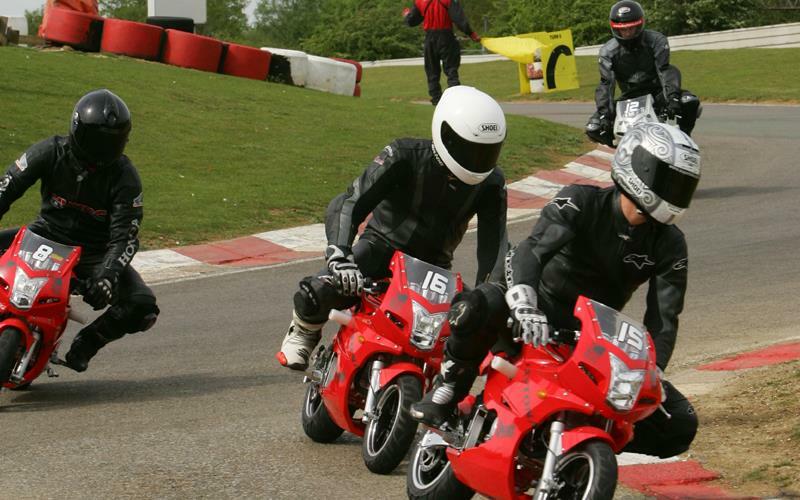 At Daytona’s karting circuits at Sandown Park in Surrey and in Milton Keynes you can now race your mates on identical midi-motos. Unlike cramped mini motos which are pretty hard for adults to get on, the 110cc are a similar size to a BMW bicycle, so they are much easier to ride for a 15 minute stint. To try out the new offer, MCN’s resident moped racing nut went along for the ride. “Walking up to the bikes they look a bit cheap and basic, which is because they are. Wobbling out onto the circuit for the first time, they feel alien to anything you’ve ever ridden. They wobble, twitch, and as we were riding the bikes for the first time the un-scrubbed tyres were hairy too." "They’re easy enough to control – twist and go, one brake on each bar like a push bike is simple to do, but hard to keep into control – the handling is crap, frankly, and even the slow revving motor overwhelms the tyres and dumps you on your backside. But everyone else has the same disadvantage, so it equals out if you figure out the limits. I didn’t, and in the qualifying heats I managed to lob it twice, and take out another ride with my head in the process!" "You get three heats to decide grid position in the final, where everyone goes out on track and competes for the final awards. In the all-journalist race I competed in there was a few crashes, including the poor bloke in front of me who crashed out of second on the penultimate lap after I found the horn was a useful distraction tool! Daytona told MCN that the current bikes may be swapped for better spec machines – they were purchased for the initial trial period, and are likely to change. To ride you need to be at least 18 and must hold a CBT certificate. • For a day’s racing you’ll need a minimum of 15 riders, so it’s ideal for a work day out or a mate’s day. It costs £50, plus a £50 deposit for crashing the bike, and if you require leathers, helmet, boots and gloves there’s an additional £50 deposit. That means it’ll get expensive if you crash, and makes it worth considering using your own kit and taking it easy. Details: 0845 644 5503. Held City Bag £49.99 Tester: Tim Thompson Time tested: Three months/1500 miles What’s good? Price.